We are already in Week 5 of the Kansas high school football season. District play has started in the 8-man divisions and will begin in Class 2-1A this week. Each week’s results begin to help clarify which teams are contenders and which others have already played their best ball of the season. Last Friday night’s action produced several upsets and a few top-ranked teams were really challenged. In total, eight ranked teams lost during Week 4. How did that impact the rankings? Here are the Week 5 Kpreps.com rankings powered by Pinamonti Physical Therapy. Lawrence Free State takes over the top spot in Class 6A after the Firebirds won the No. 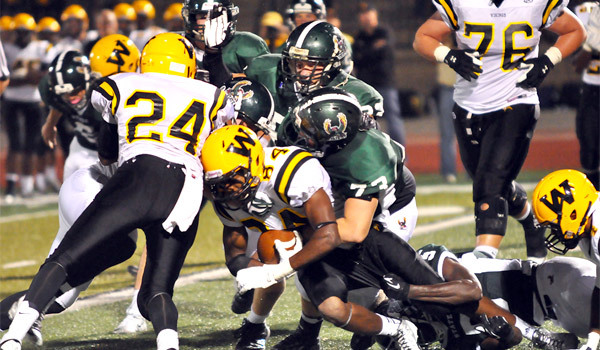 1 versus No.2 showdown by besting Shawnee Mission West 35-14. Free State scored two touchdowns late in the first half to take a 21-7 lead, and then took advantage of three Viking turnovers in the second half to pull away. It’s the second consecutive year Free State has beaten Shawnee Mission West during the regular season, but last year the Vikings got their revenge in the state semifinals. Derby checks in at No. 2 this week and is inching closer to the top spot where they began the season. Their nemesis from the west side of the bracket, Hutchinson, is ranked third this week followed by Shawnee Mission West at No. 4. Topeka High remains ranked fifth after a 30-20 win over Shawnee Heights in the Cox Friday Night Live Game of the Week. After Week 4, we began to wonder if anyone wanted to be ranked in Class 5A. Three teams in the top five fell last week, albeit to solid 6A opponents. In addition, top-ranked Bishop Carroll trailed by double digits before rallying to win. The Golden Eagles remain atop our 5A poll after beating Wichita West 20-10. While it is rare for a ranked team to lose and not drop in the polls, Bishop Miege stays at No.2 this week despite a 56-51 loss to Gardner-Edgerton. Our ranking team felt that punishing Miege for losing to a team just outside our 6A poll was a little harsh given the parity in 5A this season and the shake-up in the remainder of the poll from Friday night. The Stags remain one spot in front of Blue Valley; a team Miege beat 24-15 earlier this season. Fellow Eastern Kansas League member Blue Valley West falls one spot to No. 4 this week after dropping a 28-21 overtime decision to Blue Valley Northwest. Finally, Mill Valley checks in at No. 5 this week after dominating unbeaten Tonganoxie 27-7 in the fans choice for the Kpreps Game of the Week for Week 4. In Class 4A, top-ranked Holton survived a scare from Hiawatha but turned the Red Hawks away three times in the fourth quarter to hang on for a 12-10 win. Andale remains at No. 2 after blasting Towanda-Circle 66-7, and No. 3 Baldwin continues to roll as they beat Spring Hill 45-6. Buhler moves up one spot to No. 4 this week after handling McPherson 35-7, and Coffeyville enters the rankings at No. 5 after three LaDarrius Johnson touchdowns in the fourth quarter put the ‘Nado on top of Fort Scott 27-21. Eudora, which had won all three of its games by less than seven points, lost to Frontier League rival Paola and fell out of the poll. Defending 3A champion Scott City saw a 17-game winning streak end at the hands of Ulysses 25-6. The Beavers fall out of the top 5 this week as does Garden Plain which couldn’t keep up with Tyler Burns and Wichita Trinity. Burns rushed for 305 yards and five scores as the Knights beat Garden Plain 47-28. Conway Springs moves up a spot to No. 3 and will get the pleasure of trying to slow down Mr. Burns this week. Rossville enters the rankings at No. 4 after they blasted Riley County behind a huge night from Tucker Horak, and Phillipsburg is ranked fifth after another impressive win in beating Smith Center 43-18. The Class 2-1A poll did not change as all five teams rolled to double-digit wins. Only No. 3 Meade had a little trouble in that their game with Cimarron had to be finished on Saturday due to weather. The 8-Man, Division I poll also remains the same this week as each team won by the 45-point rule. Top-ranked Madison will step outside of district play in Week 5 as they travel to take on unbeaten Chetopa in a game that was recently added to the schedule. Second-ranked Kiowa County figures to get a test as well this week when the Mavericks host unbeaten South Central. The major shake-up in the 8-Man, Division II poll occurred as a result of Beloit St. John’s-Tipton’s 42-38 win over previously No. 2-ranked Thunder Ridge. The Blujays scored 12 points in the fourth quarter to rally for the win and move into the Division II poll at No. 5 this week. Baileyville B&B remains on top, while Hanover and Sharon Springs-Wallace County each move up one spot to No. 2 and No. 3, respectively. Those two sets of Wildcats will square off this week in one of the premiere games in the state for Week 5. Victoria is ranked fourth this week after the Knights blasted previously unbeaten Central Plains 66-28.